The momentum is really building for the Ann Arbor Mini Maker Faire. 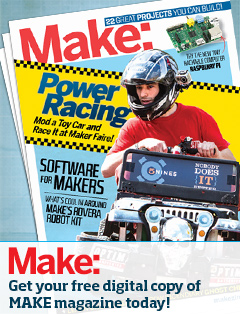 We’ve had some great press lately, thanks to AnnArbor.com and MakerBridge. AnnArbor.com is our equivalent of a local newspaper and Jennifer did a great job capturing the history and spirit of the our Mini Maker Faire. The fine folks over at MakerBridge are also showing their support of us with an interview focusing on what folks can expect to experience at the Maker Faire on Saturday. We also have over thirty volunteers who have signed up to help us greet participants, help Makers get set up, teach folks how to solder, and generally make the Faire happen. A big thank you from us organizers to you speakers, volunteers, sponsors, makers, and participants. 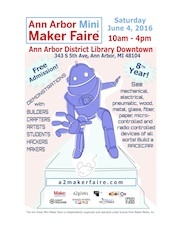 The Ann Arbor Mini Maker Faire celebrates its fifth year because of you!